We are finally at a point where we can share some room updates! While we are in the very beginning stages of a major kitchen remodel I thought I could show off some of updates we made to the cleaner areas of our house. When we first saw our home, this is how the back sun room/study area looked. 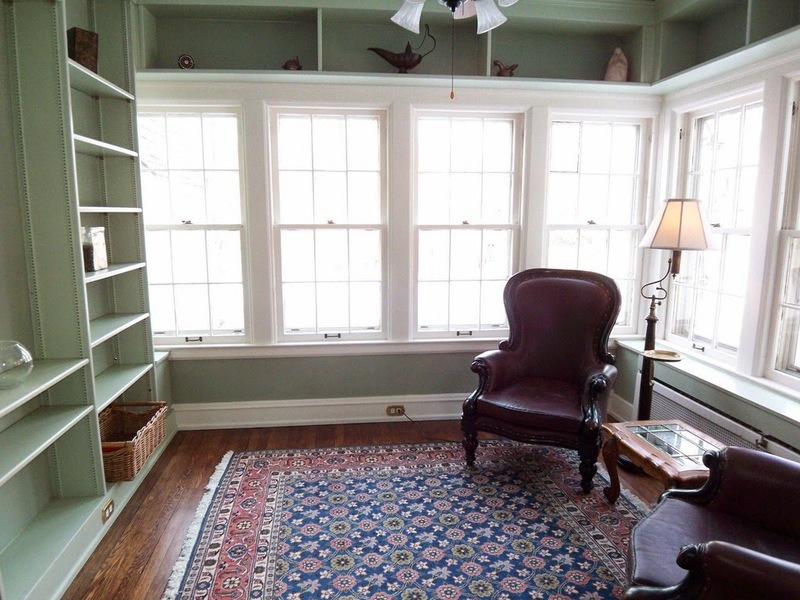 Even in the late winter, the light in this room was amazing thanks to the seven windows! We knew right away that this would be a perfect spot for Oliver to play. Up until Christmas, the room was strewn with toys and books but now there's a nice train table in the middle of the room, window shades, and a rug! That's serious business for us. Take a look! Because we have seven windows in this room, and because I'm obsessed with dark paint, I really wanted to go with a dark color. We tried so many colors that O started to think it was normal to grab a brush and throw some paint up on the wall any old day of the week. We finally settled on Naval from Sherwin Williams. The shelves are filled with a mix of playful artwork and toys. On a good day, we keep things organized but most of the time I just pick the toys up off the ground and am satisfied with that. The incredible motorcycle was picked up off of a tree lawn the day we moved in! It was the best trash pick ever. JJ spent lots of time on Craigslist looking for this train table and finally found one in time for Christmas. We picked up the rug online and the rest of the place was pieced together over the last year of living here. It's a great place to play! Happy Tuesday, friends! Artwork by: Grey Cardigan (of course). Kiddo Design for Made in the 216. Suzuran Photography. And a few other local peeps. A Weekend In The Sun.